Saris vs. Yakima: Which Bike Rack is Best? Discover the best bike racks for your ride, Saris or Yakima. Your bicycles are no cheap investment, and it’s important to transport them with the delicate care they require. That’s why choosing the right bike rack can be an overwhelming decision. Important things to consider are the mounting style, vehicle fitment, bike capacity and the type of bikes you’re hauling. To make the choice easier, two popular bike rack brands to consider are Saris and Yakima. Both are offered in many different styles, to fit all bicyclists’ needs. The differences between the two depend on your unique needs, and each brands’ unique offerings to fulfill them. Saris is a provider of quality bike racks – and only bike racks. Since bicycle parking, whether on your car, in your garage or in public spaces, is their only priority, Saris put their full attention into perfecting your bike rack. For cyclists who like options, a Saris bike rack is for you. The lineup of Saris bike racks is so vast that you get to choose between things like trunk or hitch-mounted racks, yellow or pink racks and one or three-bike racks. And, they focus on using environmentally-friendly, sustainable products while promoting bicycling as a means of transportation worldwide. Two great options are the Saris Bones 2 rack and the Saris Thelma rack. The Saris Bones rack is a trunk-mounted rack that holds up-to three bikes, and is available in a full rainbow of colors. Its ultra-basic design is the strongest and most environmentally-friendly rack you can buy. 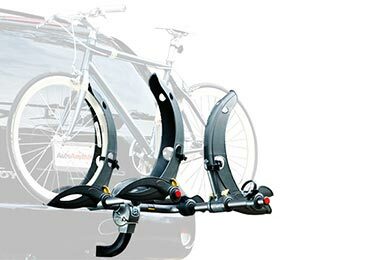 The Thelma, a Saris hitch bike rack, holds 2 or 3 bikes and is designed for easy installation, loading and unloading by just one person. All Saris bike racks feature unique cradles and ratchet straps to keep your bike secure, without harming the frame. They’re designed to work with most vehicle and bicycle types, so you’re sure to find one that works for you. For those looking for endless options and an environmentally sustainable product, look no further than Saris. With a name deeply rooted in outdoor adventure, a Yakima bike rack is a trusted source of bicycle transportation. Yakima is also a well-known brand amongst other travel accessories, including roof racks and cargo carriers, and their products work together cohesively. Like Saris, Yakima offers a variety of racks including hitch-mounted racks and trunk-mounted racks. One popular Yakima bike rack is the hitch-mounted, DoubleDown Ace Bike Rack. Available in multiple sizes, depending on the amount of bikes you have, this rack fits in 1 ¼” or 2” receiver hitches. And, it tilts away from your rear bumper to allow access to your cargo area. A unique feature of your Yakima Double Down Ace bike rack is the built-in bottle opener (for a little post-bike-ride celebration). 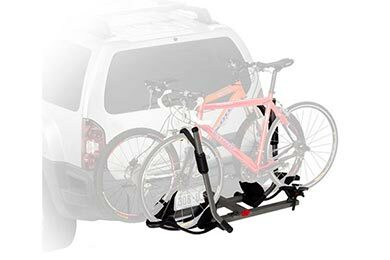 Yakima racks keep your bikes secure and are easy to use. Since they also make a variety of other products, their bike racks may be for you if you’re a loyal Yakima user. Which Bike Rack is Right for You? No matter which way you decide to transport your bikes, you know they are being taken care of the right way. Be sure to check out all of our Saris and Yakima bike racks for sale, and read our bike rack reviews to determine which one is right for you. 2011 jeep grand cherokee thule bike carrier? Reference # 766-169-157 © 2000-2019 AutoAnything, Inc.